The first caress of warm sunshine, mixed with the hard slap of horizontal snow; daffodils and birdsong a reminder to keep eyes peeled for the first swallows and spring salmon. Most importantly, though, spring (the weekend of 11th/12th April actually) means final assessments for this year’s SGAIC candidates. The weekend was the culmination of six month’s hard work – swotting up on casting mechanics and lesson plans, entomology, tackle, safety and watercraft, and a hundred other things that an SGAIC instructor needs to know. And casting practice. Lots and lots of casting practice. 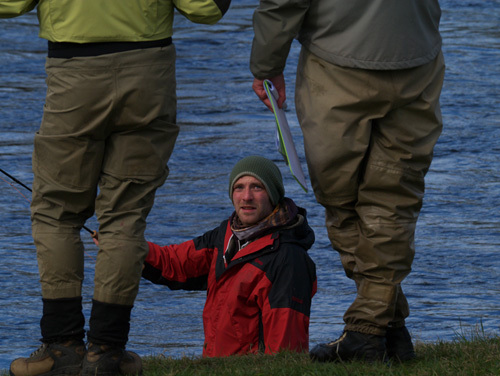 Trainee instructors spend hours and hours standing in cold rivers and fields working through the practical syllabus, getting funny looks from passers-by as they rehearse their explanations out loud to themselves. All of this (assuming a successfully completed written assessment and verbal presentation) leads to this weekend and one thing: The final practical assessment. 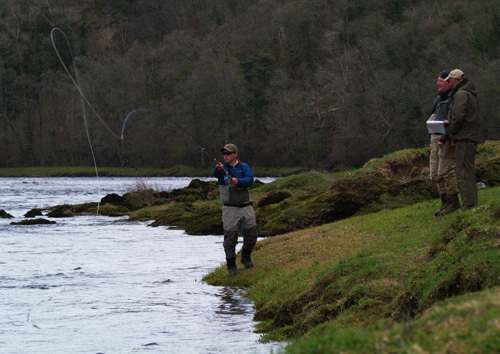 A single three-hour session standing in the river Tay near Perth. It’s a big day for candidates, and the nearer it gets the bigger it seems. Like a black hole the assessment weekend seems to swallow everything around it. Everything gets pulled in: ignored family and friends, cancelled meetings and evenings out. Nothing gets in the way of the assessment weekend. It’s a singularity. But once you’re sucked in past the event horizon, once you’re on the bank standing there next to your assessors (clip-boards in hand) an alternative reality kicks in. The nerves don’t go away completely (how could they?) but the assessors quickly put candidates at ease and create an environment where (despite the ever-present wind) they have every chance to show their skills and knowledge to maximum effect. This doesn’t happen by chance. Here at SGAIC we are committed to ensuring that all our final assessments are done to the highest standards. As always the SGAIC committee work closely with our colleagues at AAPGAI who provide the highest quality independent and qualified assessors for the weekend. 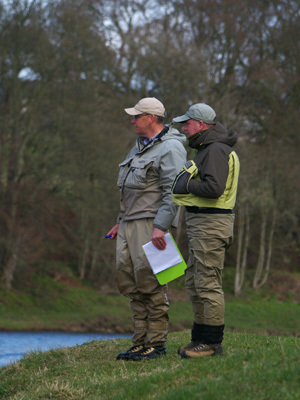 This year we welcomed back the assessor team of Paul Little, Clive Mitchelhill and Glynn Freeman to the Fishponds beat on the Tay. Not only are these guys fantastic casters, instructors and assessors, they’re just damn good company. And this is only one reason why our 2015 assessment weekend went so well. The weekend is nothing without the candidates and a huge thank you is due to all of this year’s hopefuls. We’ve really enjoyed taking you though the course this year. As usual we’ve learned a lot from you all and it was great to see you all progress as the course developed. Huge congratulations to those successful candidates this year (Greg Hutchison, Craig MacDonald, and David Mateer). These guys performed exceptionally well on the day and richly deserved their success – it was obvious how much work they’d put in. To the unsuccessful candidates: It’s always really tough when you don’t make it, but the feedback from the assessment team is that you all have great potential to succeed and to become first class instructors. It’s a testament to the whole group that nearly everyone who didn’t make it this time has said they’ll be back stronger and raring to go next year. We’ll be starting this all over again in October 2015. Join us. Where else do you get to travel though a black hole?